With more than 100 years of brush making experience, the long held tradition of German excellence is evident in every brush. The brush handles are made from locally grown wood. The raw wood is finished to a smooth perfection, then oiled to preserve and protect. With care and experience, only the best boar bristles in the world are chosen for the Desert Breeze Distributing hair brushes. These boars are raised for meat, but the bristles are saved for use in high quality brushes. The first cut of the boar bristle is the most firm, and is the only cut we use. The root (follicle) of the bristle is gentle on the scalp and is a sign of a high quality brush. 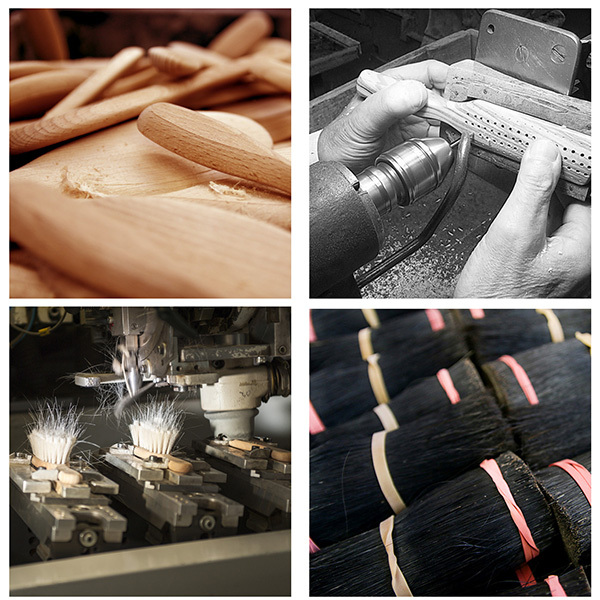 The photo at left shows bundles of boar bristles that have been cleaned, cut, and are ready to be made into brushes. The boar bristles are not from factory farms, but come from special types of wild boars raised on small farms in rugged terrains and climate conditions. Supply is limited for these unique bristles, and is why they are more expensive than those from factory farms. Boar bristles vary between species, age of the animal, and the climates they are raised in. In the rugged climates the boar bristles originate for Desert Breeze Distributing brushes, the boars grow especially thick bristles. The microscopic photo at far left shows a human hair next to a bristle from a PW1 brush (from the Tibet Plateau)and a bristle from the Calcutta brush on the right(from the highland of India).Both are from different types of wild boar, and produce high quality bristles for use in premium hair brushes. Boar bristles are good for hair because they are similar in structure. Like hair, boar bristles are made of keratin. 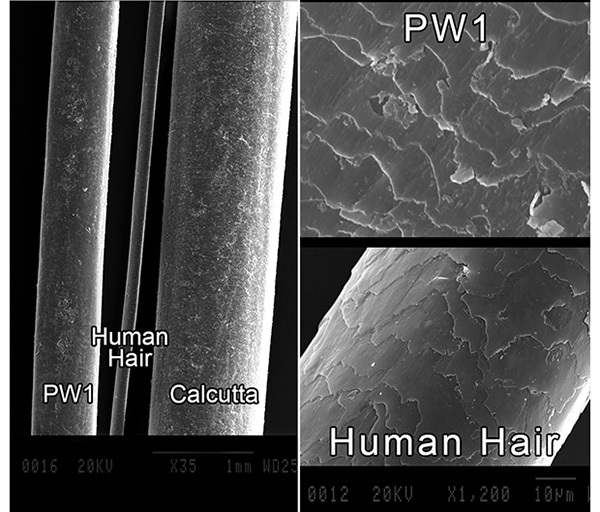 As seen in the microscopic photo at left, scales of a boar bristle from the PW1 brush closely resemble those of a human hair. These scales absorb the natural oils produced by the scalp, and distribute it gently down the hair shaft. Synthetic bristles cannot provide the same benefits of a quality boar bristle brush. *Over time, regular brushing with a boar bristle brush will have a powerful effect on the overall health of your scalp and hair, and will improve the texture and vibrancy from roots to hair ends. Brush size is 2" wide (brush area) x 8.75" (total length). PW1- Medium stiff bristles from boars raised on the Tibet Plateau. Best for fine to medium thick hair. Bristle length is 5/8". CLC - This brush has the Calcutta boar bristles, which are the stiffest bristles from boars raised in the highlands of India. Best for hair of medium thickness, or those who prefer a more rigid brush. Bristles of the Calcutta are slightly longer at 3/4". For penetration through thicker hair, brushing hair in sections may be needed. Handle is oiled pear wood, grown locally in Germany. The wood has an engraved image of the butterfly — a symbol of the gentle and transforming powers of nature. 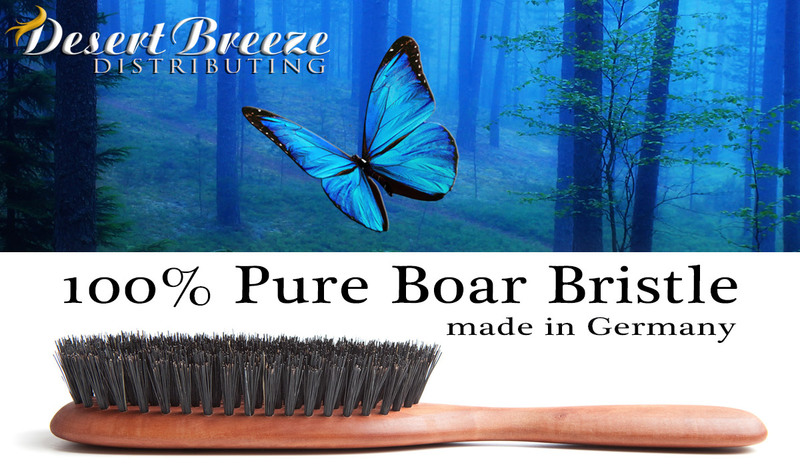 Pure boar bristle hair brushes from Desert Breeze Distributing - a brush with a soul! *Pure boar bristles naturally condition hair, improve hair texture, and reduce the need for styling products. Since boar bristles are similar in structure to human hair, they are not anti-static. If static control is needed, either smooth hair with palm of hand after each brush stroke, mist hair with water, or apply a small amount of leave-in conditioner to hair before boar bristle brushing. For best results, keep your brush free of loose hair by using a brush cleaner or a fine tooth comb. Wash the brush in lukewarm water mixed with a touch of shampoo. Do not leave the brush to soak. Rinse the brush in clear water, then dry handle with a soft cloth. Allow to finish drying at room temperature with bristles pointing downward. Proper care will prolong the life of your natural brush. 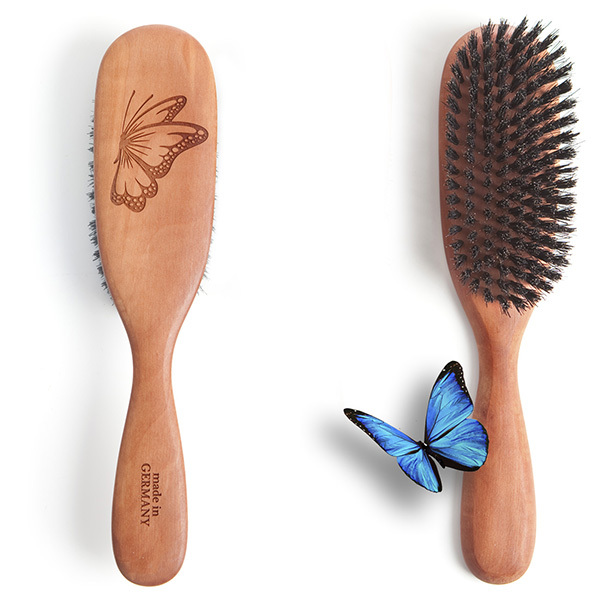 *Please note: Our hair brushes are guaranteed to be hygienic, in factory new condition, and completely unused. For this reason, returns on hair brushes are not accepted for any reason. If you have any questions or concerns before purchase, please contact us directly and we'll be happy to help you choose the best brush for your hair type. Another high quality product from Desert Breeze Distributing - a name you can trust! Best brush I've ever owned. My hair is long and beautiful. I seldom have to use hair spray. There has been such a difference in my hair so I couldn't be happier with this brush. I brush 100 times in the morning and at night. Love it. Quality hairbrush. Beautifully made. Worth every cent! You get what you pay for and this hairbrush is top of the line. Feels so good on your scalp and makes hair silky soft. Gentle on the hair. All of the ‘teeth ‘ in the brush head are boar hair. The real deal. Buy it. If you're looking for a great quality brush, this is it! I prefer to spend a bit extra and have a a brush that will last me years. I have fine hair with a sensitive scalp and the bristles aren't too rough. I'm replacing a 30 year old brush & am absolutely satisfied. This brush feels marvelous on my scalp. My hair is thin and short and these bristles are strong enough to massage my scalp. I should have replaced my old brush years ago. It's been a game changed in my no shampoo journey. During the transition period, my hair looks even better than it did before i went nopoo. This brush just leveled up my hair game and made me actually like my hair. Highly reccomend! I sent it as a gift so did not see the product. However, the recipient lost it to his son who grabbed it. Now I need to order another one for the person I had purchased the brush for. Website showing how the brushes are made is very interesting. It's wonderful to be able to purchase a quality product a la yesteryear. I have always loved brushing my hair but have been frustrated by many years of not being able to find a good, solid brush that works. This is the one! Not only is it beautiful but it feels great in my hand and on my scalp, plus it washes perfectly -- solid wood, not a coating that peels off. Excellent customer service, too. They helped me decide which brush would be right for me. Beautiful hair brush. My hair feels amazing after brushing.